We’d love your help. Let us know what’s wrong with this preview of The Family Table Slow Cooker by Dominique DeVito. The Slow Cooker is now middle aged! Invented in 1950, the Slow Cooker has been popular in the early 1970s. The miracle appliance was the perfect compliment to the busy modern life style, but considered a backwater to the world of fine food. That all changes now! Veteran bestselling cookbook author Dominique DeVito introduces a whole new take on great slow foods! DeVito c The Slow Cooker is now middle aged! Invented in 1950, the Slow Cooker has been popular in the early 1970s. The miracle appliance was the perfect compliment to the busy modern life style, but considered a backwater to the world of fine food. That all changes now! To ask other readers questions about The Family Table Slow Cooker, please sign up. The Family Table Slow Cooker is a cookbook that offers a variety of recipes that can be made in a slow cooker. According to the cookbook's introduction, the author's goal is to give busy families a resource to get healthy meals on the table in minimal time. You get all the ingredients in the slow cooker, go about your day (or night), and it's waiting to nourish you and your family/guests. The 112 recipes cover multiple cultures, dietary/nutrition needs, and offer tips for how to add textures to The Family Table Slow Cooker is a cookbook that offers a variety of recipes that can be made in a slow cooker. According to the cookbook's introduction, the author's goal is to give busy families a resource to get healthy meals on the table in minimal time. You get all the ingredients in the slow cooker, go about your day (or night), and it's waiting to nourish you and your family/guests. The 112 recipes cover multiple cultures, dietary/nutrition needs, and offer tips for how to add textures to the meal if so desired. It provides meal ideas and lovely photography for breakfast dishes, snacks, soups, side dishes, main dishes, and desserts. I bookmarked a few recipes I plan to try and it gave me a gentle reminder that the slow cooker can be used for far more foods than the few I associate it with. Thank you to the following for permitting me access to an advance reader's copy (ARC) of The Family Table Slow Cooker: Easy, healthy and delicious recipes for every day. This generosity did not impact my honesty when rating/reviewing. I received a free e-copy of The Family Table Slow Cooker: Easy, healthy and delicious recipes for every day from NetGalley for my honest review. I have always been a huge fan of the slow cooker. I also have a huge collection of different slow cooker recipe books. This book is one I will be purchasing a hard copy of for my collection. Wonderful instructions, bright colors and beautiful pictures. Fantastic healthy and delicious recipes including: breakfasts, appetizers, soups, side dishes, main di I received a free e-copy of The Family Table Slow Cooker: Easy, healthy and delicious recipes for every day from NetGalley for my honest review. The Slow Cooker is now middle aged! Invented in 1950, the Slow Cooker has been popular in the early 1970s. The miracle appliance was the perfect complement to the busy modern life style but considered a backwater to the world of fine food. That all changes now! Veteran bestselling cookbook author Dominique DeVito introduces a whole new take on great slow foods! DeVito catalogs recipes covering breakfast, snacks, and dinner, and appeals to all sorts of ethnic traditions. She features fresh farm-to-table ingredients, and highlights ribs, roasts, chicken, pork, and beef, whiles also offering a wide range of International flavors, including French, Italian, Caribbean, Mexican, and other ethnic dishes, as well as new healthy takes on such staples as four-cheese mac and cheese, six bean chili, old fashion Boston baked beans, classic stews and amazing spicy jerk dishes. Detailed instructions smooth the way for cooks new to this time-tested cookware. I really, really, really need to stop requesting cookbooks through #NetGalley as I keep ending up ore-ordering and buying them (for myself – I am more than happy to spend my library’s monies on them!) And since #thisisus made crockpots/slow cookers THE enemy of the state I was more than happy to un-vilify their reputation. I love my slow cooker and am always looking for new recipes to try out – this book has many, many that I have put the ingredient’s on next week’s shopping list for. Simple but gourmet, this book does not disappoint!!! Author DeVito accomplishes what is promised on the cover: fairly easy recipes for items (not whole meals) using a slow cooker as the main cooking device. The recipes are beautifully presented with plenty of photographs of the finished items. The food is all very family-friendly with no strange or odd variations to make old recipes look 'new'. There are roughly 100 recipes broken down into the following sections: Breakfast treats, Appetizers and finger foods, Soups, stews, and chilis, Side dishes (pasta, pork, rice), Side dishes (vegetables), Main dishes with meat, Fish and seafood dishes, Delicious deserts. The book includes a short 2 page introductions with a bit about slow cookers. But there are no tips sections on choosing a slow cooker, safety when slow cooking (to prevent food poisoning), or cleaning slow cookers. Each recipe has a large main title, a short paragraph description, serving size in blue, ingredients list on the left in bold and italics, numbered steps on the right, and then a callout blue box underneath with more information/tips. The fonts are fairly small but the recipes are, for the most part, full page and cleanly presented. Nearly every recipe has a full page image of the finished product. The book is set up to be very no nonsese - very little fluff and everything you need to make the item. If I had a nitpick and issue with the book, it's that the steps are really oddly numbered. I'm well aware of the trick of sticking everything into a chunk so it looks like only a few steps - rather than giving you step by step directions that would be easier to read and follow but with more numbers and shorter sentences. And while following these recipes, it became frustrating and irritating at how random so many of the step divisions were set up. E.g., step two would have you make two different sauces and be a big chunk of text. Step three would be one sentence telling you to mix the two. Why not separate the sauce steps so the step 2 wasn't so large? It felt so random - like it was written by someone who just randomly put steps together, making sure there weren't too many of them so that people weren't daunted if it looked like too much work to make an item. But in all, I liked the recipes and for the most part, my meals came out tasting well and were fairly easy to cook. Be prepared to have a lot of fresh herbs available since most recipes call for very fresh ingredients. Reviewed from an advance reader copy provided by the publisher. Chartwell Books and NetGalley provided me with an electronic copy of The Family Table Slow Cooker: Easy, Healthy, and Delicious Recipes for Every Day. I was under no obligation to review this book and my opinion was freely given. The Family Table Slow Cooker is a comprehensive cookbook with sections such as : Breakfast Treats; Appetizers and Finger Foods; Soups, Stews, and Chilis; Side Dishes: Pasta, Potatoes, and Rice; Side Dishes: Vegetables; Main Dishes with Meat; Fish and Seafood Dishes; and Chartwell Books and NetGalley provided me with an electronic copy of The Family Table Slow Cooker: Easy, Healthy, and Delicious Recipes for Every Day. I was under no obligation to review this book and my opinion was freely given. The Family Table Slow Cooker is a comprehensive cookbook with sections such as : Breakfast Treats; Appetizers and Finger Foods; Soups, Stews, and Chilis; Side Dishes: Pasta, Potatoes, and Rice; Side Dishes: Vegetables; Main Dishes with Meat; Fish and Seafood Dishes; and Delicious Desserts. Readers are treated to a cookbook designed to give full use to the slow cooker. The Family Table Slow Cooker includes more than 70 easy to make dishes from around the world, with many healthy options for the busy family. With beautiful photographs accompanying many of the recipes, readers will easily be able to visualize the finished dishes. Soon-to-be favorites for entertaining include Seasoned Mini Meatballs (p. 33), Stuffed Mushrooms (p. 45), and Mustard and Garlic Drumsticks (p. 54), giving readers a reason to have more than one slow cooker. Hearty offerings for fall and winter include recipes such as Chickpea Soup with Hearty Greens (p. 62), Bean, Corn, and Barley Soup (p. 71), and Can't-Miss Beef Stew (p. 89). Readers are sure to find many options that will be appetizing to adults and children alike. The Pasta, Rice, and Potato section has many versions of risotto, as well as different potato dishes and pastas smothered with delicious sauces. Main dishes with Meat have elevated offerings such as Beef Short Ribs with Rosemary and Fennel (p. 147) and kid friendly recipes such as Sweet-and-Savory Ham (p. 150). The whole family will enjoy recipes such as Arroz con Pollo (p. 168), Fall Fruit Crisp (p. 214), and Chocolate Fondue (p. 216). If I had to choose between every single gizmo, gadget and small appliance in my kitchen and keep only one, hands down it would be my slow cooker. I have had too many jobs with long and unpredictable hours, so I know that I either set up the slow cooker before leaving for work or I would be picking up take out on the way home. I have a list of go-to recipes, however, some of the ingredients don't really 'scream ' healthy meals. The Family Table Slow Cooker provided me with many new healthy recipe If I had to choose between every single gizmo, gadget and small appliance in my kitchen and keep only one, hands down it would be my slow cooker. I have had too many jobs with long and unpredictable hours, so I know that I either set up the slow cooker before leaving for work or I would be picking up take out on the way home. I have a list of go-to recipes, however, some of the ingredients don't really 'scream ' healthy meals. The Family Table Slow Cooker provided me with many new healthy recipes that cover breakfast(never thought to use it overnight), appetizers, side dishes, vegetables, meat and even desserts. So far I have tried the Banana Oatmeal, Seasoned Mini Meatballs, Chickpea Soup with Hearty Greens and the Pumpkin and Pear Soup. All the ingredients were easy to find for each recipe and tasted great. The one thing missing(for me) was nutritional information. When a recipe includes sodium totals, etc., I can easily decide on substitutions that will work if the numbers are too high for me or move on to another choice. This takes some additional research, but it is certainly doable. This book opened my eyes to additional ways to use my slow cooker, and as I always seem to need more than 24 hours in a day, that is a very good thing. When you've got a busy day ahead of you, the last thing you want to worry about is getting dinner on the table. If you've got a slow cooker, there's nothing to worry about. Dinner can cook itself, so to speak, while you take care of everything else that needs doing. I love the convenience of using a slow cooker, so I'm always on the lookout for new recipes to try. The Family Table Slow Cooker is an excellent source for recipe ideas for everything you can think of, and a few things you would never When you've got a busy day ahead of you, the last thing you want to worry about is getting dinner on the table. If you've got a slow cooker, there's nothing to worry about. Dinner can cook itself, so to speak, while you take care of everything else that needs doing. I was very pleased with this cookbook. The recipes are easy to understand and follow, and the color photographs of the finished dishes are enticing. If you enjoy collecting cookbooks as much as I do, this would be an excellent addition to your shelves. I absolutely love slow cooking and I think if I had to choose one item to take to a desert island it would be my slow cooker. I have many cookbooks filled with healthy and easy recipes for the slow cooker that I have made time and again for my family for dinner and they love to eat these meals. That said I was very pleased to read and try some of the wonderful and very delicious recipes in The Family Table I was given a copy of this book through Netgalley and the publishers for an honest review. Veteran bestselling cookbook author Dominique DeVito introduces a whole new take on great slow foods! DeVito catalogs recipes covering breakfast, snacks, and dinner, and appeals to all sorts of ethnic traditions. She features fresh farm- The Slow Cooker is now middle aged! Invented in 1950, the Slow Cooker has been popular in the early 1970s. The miracle appliance was the perfect compliment to the busy modern life style, but considered a backwater to the world of fine food. That all changes now! I received an advance copy of this from NetGalley in return for an honest review. We swear by our slow cooker and it's great to find more original recipes so we can use it to it's full potential. There are a lot of recipes here that I can't wait to try out, especially the breakfasts and the puddings. And this just helps me get through meal times, usually dinner. So why the The Family Table Slow Cooker? I mean, don't you just chuck everything into the cooker and let it stew? Technically that is still true, but a slow cooker than do more than just stew okay! One of the recipes that I fancy is the mashed potatoes. Don't laugh, but if you wake up early, chuck the potatoes in the pot and do what it says, by lunch time you would at least get mashed potatoes. All you have to do is grill some sausage And this just helps me get through meal times, usually dinner. So why the The Family Table Slow Cooker? I mean, don't you just chuck everything into the cooker and let it stew? Technically that is still true, but a slow cooker than do more than just stew okay! Beautiful photos. More breakfast recipes for a slow cooker than I could have ever dreamed up. Many new dishes that will be great to try! A good addition for your cookbook collection. 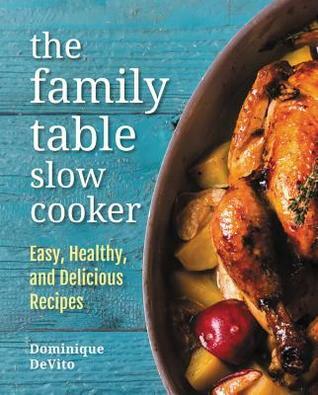 The Family Table Slow Cooker by Dominique DeVito is a free NetGalley ebook that I read in late May. It's a little off-putting with a repetitive use of the same font (Garamond) and I'm not exactly bowled over by its originality. There is a bright use of colors in photos of ingredients, finished products, and mood-making photographs (old cars, wheelbarrows, tractors, barns, dogs). My personal favorite recipes are for banana bread, curried cauliflower, salmon chowder, baked ziti, broccoli rabe, ta The Family Table Slow Cooker by Dominique DeVito is a free NetGalley ebook that I read in late May. This book had me drooling at all the pictures. Some how they even made seafood (which I hate with a passion) look good. The recipes seemed like they would be easy to follow – your food should turn out perfect! I am seriously thinking about buying this book as I eat about 1/2 of what is in it. I have been having to use my slow cooker more often and this will be perfect! A fantastic recipe book. A very simply setup with lovely recipes and stunning photos. It even has UK measurements. Thanks to netgalley for letting me read this. Filled to the brim with easy to follow, beautifully delicious slow cooker recipes. There are many recipes in this collection that I can't wait to try. I am a huge fan of freezer meal prepping, and a lot of the recipes in this book with be perfect for that. Let me tell you the problem with slow cookers: it might save you cooking time by setting one if you are out for a few hours, but working a twelve hours day with an hour of commuting time can run most recipes that call for a low setting for 8 hours, and the cooking time you saved is now being spent cleaning the slow cooker. Following that, my problem with the recipes (as with most recipes) lies in the ingredients. There are too many items I can't find at Walmart with too few substitutions. I appre Let me tell you the problem with slow cookers: it might save you cooking time by setting one if you are out for a few hours, but working a twelve hours day with an hour of commuting time can run most recipes that call for a low setting for 8 hours, and the cooking time you saved is now being spent cleaning the slow cooker. Following that, my problem with the recipes (as with most recipes) lies in the ingredients. There are too many items I can't find at Walmart with too few substitutions. I appreciate that the idea of this book is 'low maintenance gourmet'. I acknowledge I may not be the target market for this book. But then who is? Things like oatmeal and bacon wrapped dates can be done pretty easily without a slow cooker. I could see these recipes appealing to the low working class, if they don't have the resources or space for ovens, casserole dishes, an assortment of pots and pans, etc. That market ends up not buying this book because of the obscure/expensive ingredients and the fact that the more budget friendly recipes can be found online at the library. So we go up a few classes, and work with those who go to farmer's market and know where to buy escargot. They might have someone who comes in once a week to clean slow cookers and assorted dishes. That's a fairly small market who again, could do an internet search. Wow! 5 Stars for this amazing book of uncomplicated and absolutely delicious ways to use your slow cooker or Crockpot.